The revolutionary Morgana 104 Squarefold applied a squarefold finish to your booklets helping to achieve the look and feel of perfect bound books. The Morgana Squarefold 104 adds increased value to your booklets by giving them a professional, perfect bound look with the security of a stapled finish. This revolutionary device can be used as a hand-fed unit attached to the BM60/61 Bookletmaker or linked to a wide range of traditional and digital finishing devices. Added advantages of the Morgana 104 Squarefold are much less packaging capacity and the ability to print onto the spine of thicker booklets. 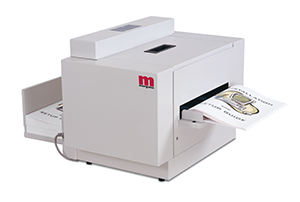 Booklets from landscape A4 to A6 size can be produced on this versatile simple to use machine. H 13" x W 16" x D 22.5"